You will find as you progress in your teaching career that the “educational process” goes through fads and phases and working walls is one of the current ones! So what exactly is a working wall? 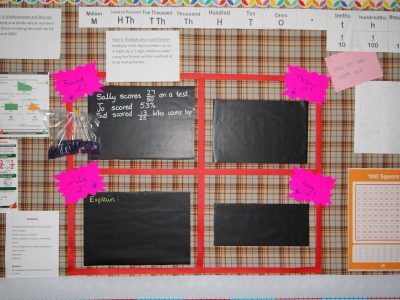 A working wall is basically an interactive display – a display that you set up in your classroom where you either structure child / class interaction or you try to encourage child / class interaction. What subjects are working walls used for? To be honest working walls can be used in any subject; they are most usually seen for Maths and English but it perfectly possible to have them for let’s say Science or Art or D/T. In fact in any subject where a particular focus is dependent on process and that can be practical, procedural or a skill based outcome. But remember – the clue is in the title…working walls are NOT information boards! But there is some confusion as to exactly how to use working walls and what should be on them! Working walls should reflect what is being covered at that time in the subject…in other words they should be up to date! In order to master a skill this needs to be broken down into its component areas – these will have been taught individually and progressively in class through the L.I’s of a unit. Therefore the working wall should also match this progression. 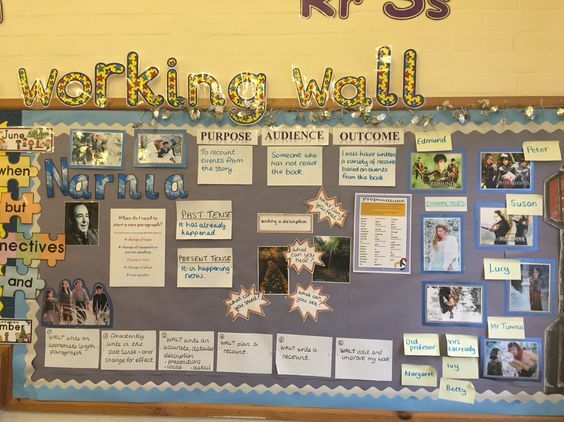 At the end of a unit of work a working wall can present opportunities for children to combine skills and knowledge in complete focused tasks / challenges. 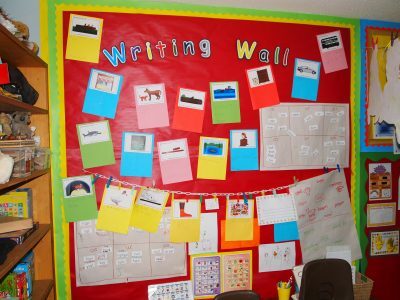 This is a writing wall from a Y1 class – it has a seating area in front and a lot of prompts and assists to help the children in their set tasks. The material is changed in line with the current curriculum focus. An excellent and practical resource that forms part of the Y1 timetable. 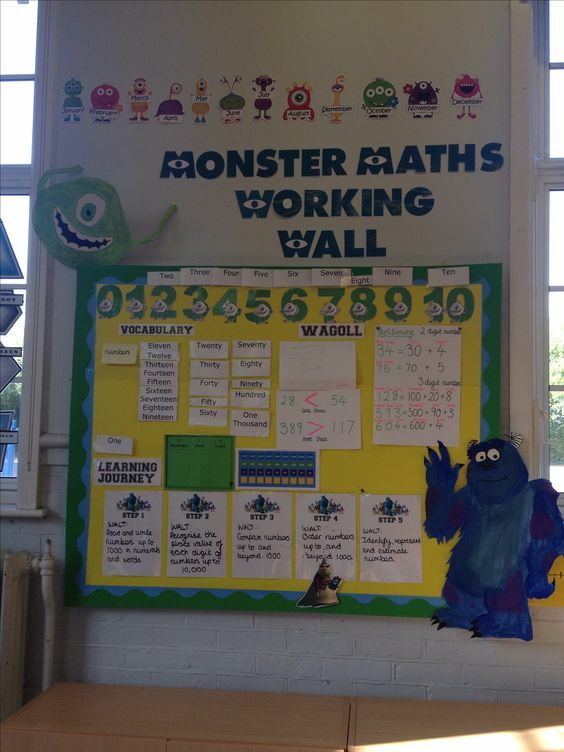 A small working wall in a Y3/Y4 classroom – the current maths topic is shown and there is a progression for the children to follow to enable full understanding… Build it, write it, draw it and say it. A challenge is set for the children to complete which relates to the fraction topic. This working wall at this point concentrates on understanding with some degree of calculations involved but perhaps not enough focus on the processes involved in the calculations. This is an example of a poor working wall- in fact a token gesture! The area shown is part of an information board for maths which is a mish mash of things. The typed focus card shown relates to multiplication and division and the calculation areas are based on fractions! No reflection on current maths topic focus. The above is not really a working wall in the sense of our definition. What is shown here is possibly the end product of a series of lessons and is here presented as prompt material covering a range of skills and processes that are required to produce a final product. If this is indeed the culmination of a series of previous working walls then it would be an excellent finale – however if it has solely appeared at the end of a process without evolving then, for our purposes it doesn’t fit the requirements. 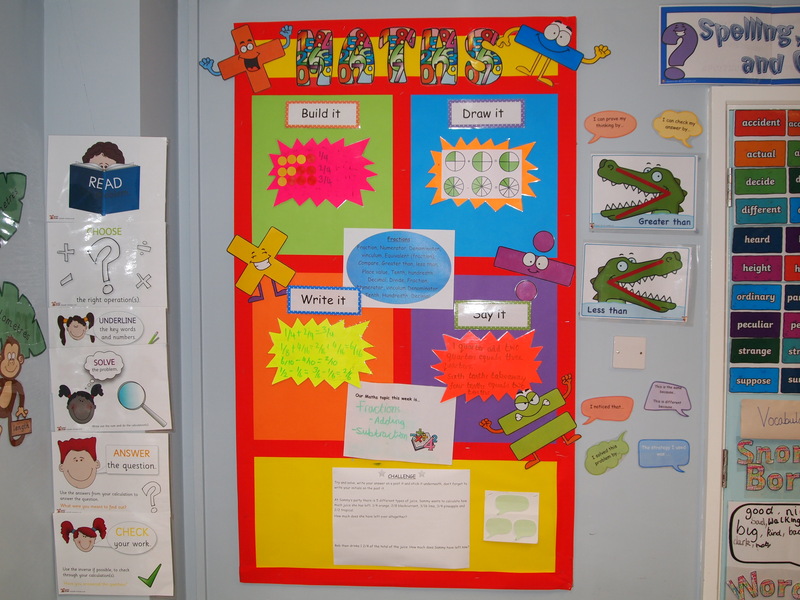 Great display and note the use of the learning journey….these are the steps (possibly the LI’s) that comprise the taught unit. Here they don’t relate to what is being done above….strange? 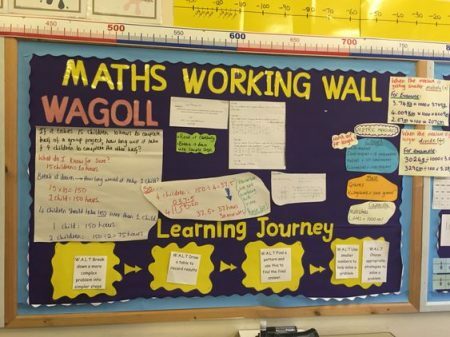 This is a good maths wall – although as shown it represents the END of a teaching unit. The learning journey represents the PROCESS by which the children approach and work through the problems set. Working walls reinforce and consolidate children’s knowledge and understanding through practical applications to learn a skill. They should reference and reflect CURRENT work and individual steps being covered in particular subjects or topics. The learning journey or process should be shown – either as the unit progresses or as a complete process with reference made to each step and the work on the board it refers to. It may come as no surprise to hear that some teachers will put up a “working wall” and it never gets used! It’s there as a nod towards the inclusion of these sorts of display. In my experience, working walls will not be used by the children if you simply put up a question or challenge and “hope” that someone will have a go – they won’t! So what is the best way to use them. They obviously need changing at regular intervals. You can build their use into your lesson planning, either in the warm up or initial lesson introductions or as part of the plenary session. This not only brings the wall to the attention of the children but they actively get to understand how the wall works and more importantly evolves. You can use the wall in any spare time you may have (yes I know we don’t have any!) So for instance in the 5 minutes before lunchtime…send an individual, pair or group to tackle a problem or task before we can all go out! By actively building in the use of the working walls then they have a use and purpose in your teaching programme and learning environment. A few definitions you may see used! WALT – We are learning to. WILF – What I am looking for. WAGOLL – What a good one looks like. TIB – This is because. Working walls are a good inclusion in your classroom environment, but they need to be current, applicable and used. They provide an additional and practical resource within the teaching and learning environment and develop not only the knowledge and understanding of the children but also the practical skills that are vital in the learning process.